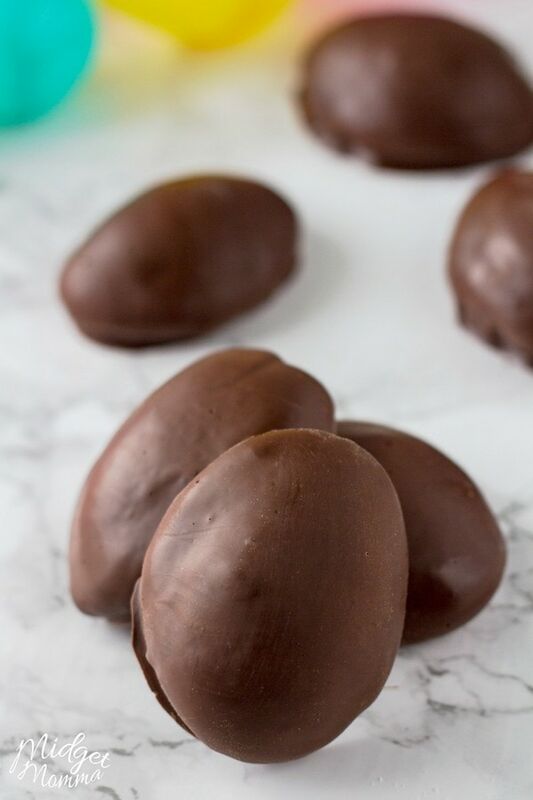 If you are looking for an amazing Easter treat then you are going to love these Homemade Chocolate Covered Marshmallow Eggs. 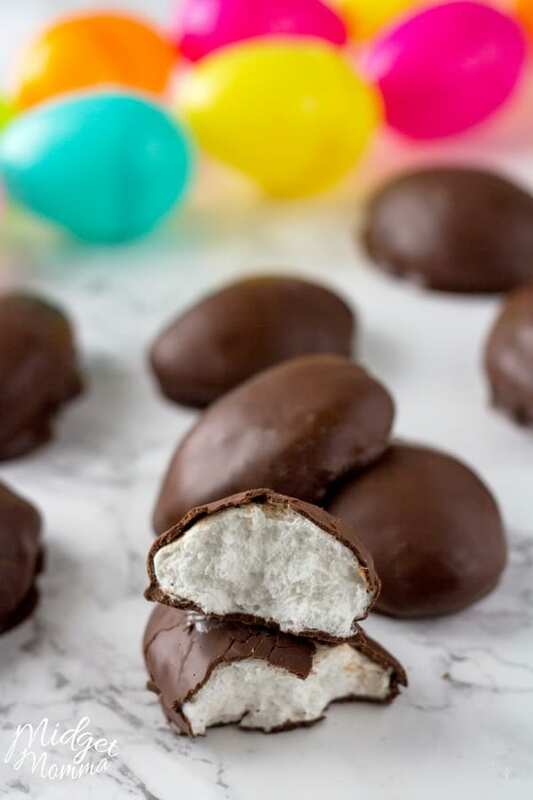 To make these Chocolate Covered Marshmallow Eggs you are going to be using homemade marshmallows, this is part of what makes these marshmallow eggs so amazing. 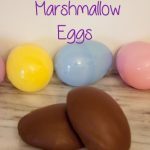 When making this marshmallow egg recipe you want to make sure that you are using a good chocolate. You do not want to use a cheap chocolate. My personal preference for melting chocolate is Ghirardelli Chocolate Melting Wafers. 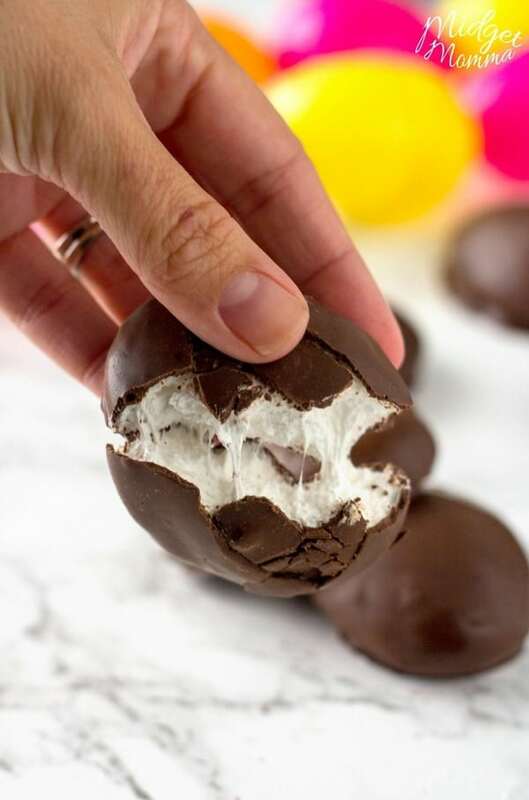 This marshmallow easter egg recipe is one of our favorite Easter treats to make. We tend to make them at the same time as we are making our Forgotten Easter Cookies. Pour flour into a deep pan about an inch deep. Use a plastic egg to press an egg shape into the flour. Then set aside your pan. Now make your marshmallows following the homemade marshmallow recipe. Once you are done making your marshmallow mixture, before allowing them too firm up scoop the marshmallow mixture into the flour egg molds you made with a greased spoon. Get your hand wet and pat down the marshmallows to have a flat bottom. 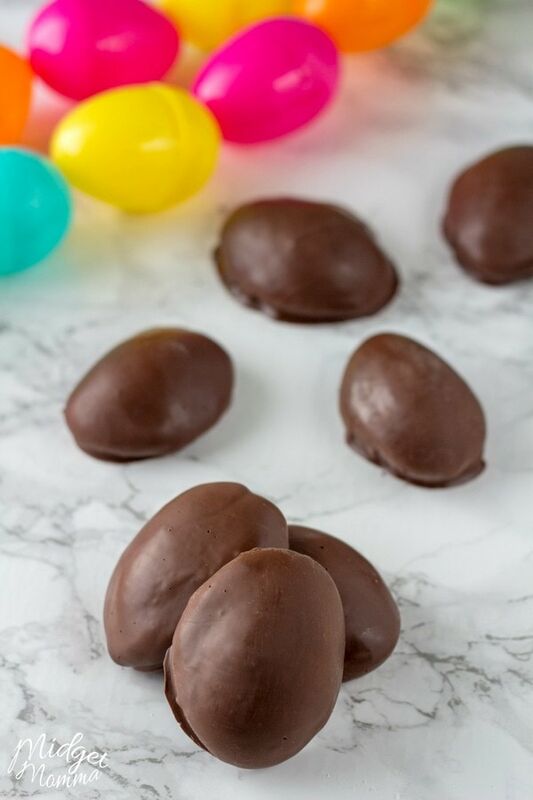 Let your chocolate covered marshmallow eggs sit at room temperature for a few hours (2-3 hours) to set up. Once they are set, carefully remove them out of the mold. Using a paper towel dust off the extra flour. Now you are going to melt your chocolate, follow the simple steps for How to Melt Chocolate in a Double Boiler and melt the chocolate. If the chocolate is to thick for your liking, you can add a little bit of shorting to help thin it out. Using a fork dip each one into the melted chocolate until they are completely coated. Tap the fork on the edge of the bowl to remove the extra chocolate. Place them on a cooling rack to cool and harden before eating. Check out this Chocolate Covered Marshmallow Video to see the steps in action. In the bowl of an electric mixer the cold water in and sprinkle gelatin on top. Soak for 10 minutes. Combine sugar, corn syrup, and 1/4 cup water in a small saucepan. Bring to a boil and let it boil for 1 minute. Pour boiling syrup into gelatin and mix on high speed. Add the salt and beat for 12 minutes. Add vanilla and incorporate into mixture. Brush your spatula with oil and scrape the mixture onto a sheet pan lined with parchment paper brushed with oil and spread evenly. Cover with another piece of paper brushed with oil. Let mixture sit for a few hours. Remove from pan, dredge the marshmallow slab with confectioners’ sugar and cut into equal pieces with a pizza wheel. Dredge each piece of marshmallow in powdered sugar. Pour flour into a deep pan about an inch deep. Use an egg to press an egg shape into the flour. 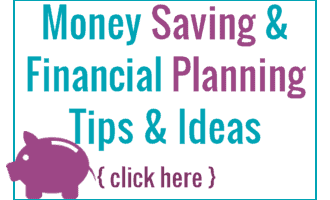 Make the marshmallows and using a greesed spoon pour into the egg molds. With a wet hand pat down the marshmallows to have a flat bottom. Let them sit at room temptaure for a few hours to set up. Take them out of the mold. Using a paper towel dust off the extra flour. Using a double boiler (How to Melt Chocolate in a Double Boiler) melt the chocolate, if the chocolate is to thick you can add a little bit of shorting to help thin it out. Using a fork dip each one into the melted chocolate until they are completely coated. Tap the fork on the edge of the bowl to remove the extra chocolate. Place them on a cooling rack to cool and harden before eating.